My then, 1 and a half year old son was just too young to appreciate Halloween and how much joy it brings to me to get him dressed up in an adorable get up. I bought a costume for his first Halloween, a skunk, which was adorable as well, but I am one of those moms who want to make as much as possible myself. When October came around again I realized I had to come up with an idea for his costume. We had just moved to Germany, and were still in the process of unpacking. I looked at the piles of boxes surrounding me and thought “It would just be lazy to NOT use one of these for his costume!” Of course I thought of the overdone robot, and didn’t want to go there, nor did I think my toddler would appreciate limited movement being encased in cardboard. Then I thought of doing a sandwich board, I couldn’t think of anything to put on it though. That got me thinking about food. The kid loves popcorn, as he was just introduced to it for the first time. 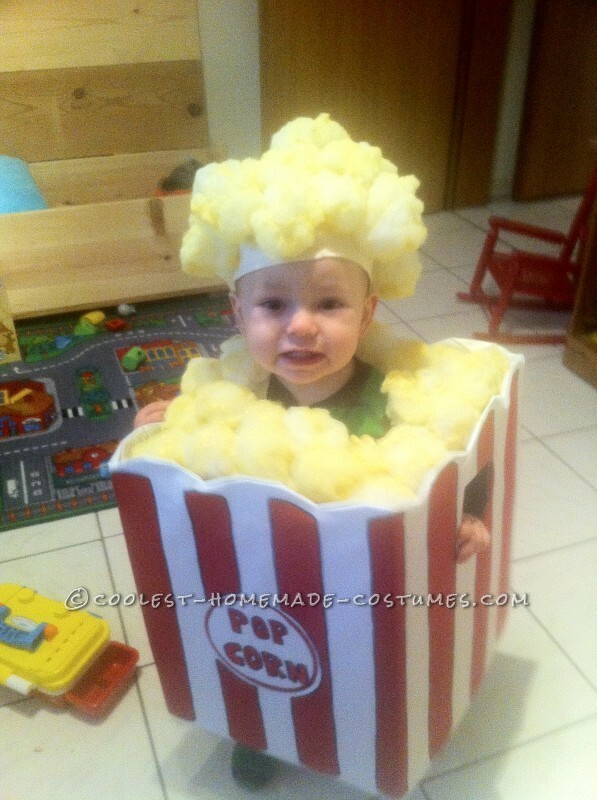 I had done a circus themed party for his first birthday several months back and had a couple plastic popcorn tubs sitting on top of an open and overflowing moving box in the kitchen. It was staring me in the face! Popcorn! I had seen a costume of “grapes” before and thought, “How simple and adorable!” So there I had it. 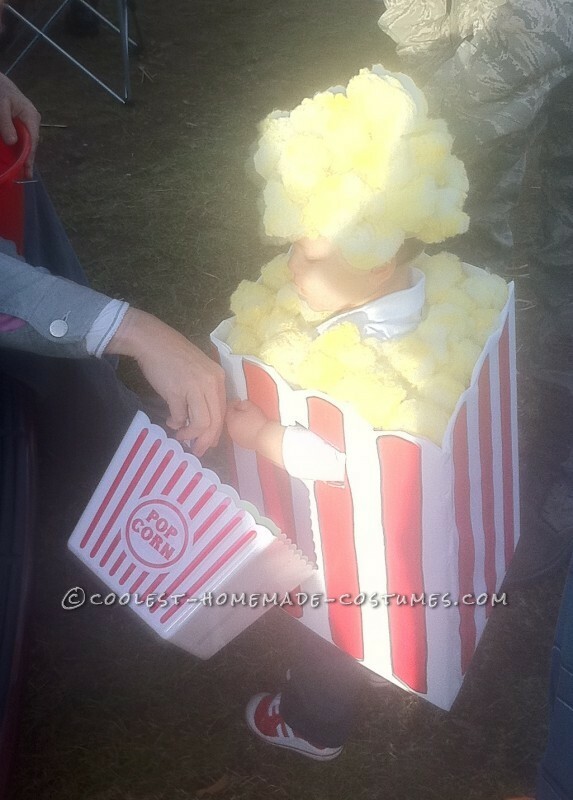 He would be popcorn, and use this plastic popcorn tub as his candy tub. I picked a smaller box, (as I had plenty of sizes to choose from) and cut the top and bottom flaps away, leaving the four main sides. Then I had him stand up and marked with a sharpie, on the inside where his shoulders would be. I made sure to hold the box up so it was several inches off the ground. I drew circles and cut them out for his arms. Then I hot glued two lengths of red grosgrain ribbon on the back about five inches in. with him in the box, arms in the holes, I held the other end of the ribbon to the inside front, making it tight so that the ribbon would rest on his shoulders and hold the box up. I taped it in place, doing both sides so it was level. I took the box off him and hot glued to replace the tape. Then I cut scallops on the top edge to mimic the plastic tub I was using as inspiration. I used a craft knife. After that I covered the entire box in white contact paper, folding over the top and bottom edges. I free hand drew on lines for the stripes and the circle in the front middle for the word popcorn. I used red and black paint to color it in. This wasn’t enough for me so I didn’t stop here. I had some linen from an old project so I laid a square piece on his head and, in between wiggles, used tape to gather it all around to fit to his head. After I took it off of him, I used hot glue to replace the tape and glue all the folds and tucks in place. I could have sewn it, but I knew it wouldn’t be seen anyway and I didn’t want to go to that much trouble. I had a bag of poly fiber fill so I grabbed several small handfuls of it and rolled it up like meatballs. Then I took some buttery yellow craft paint and put a small puddle on a paper plate. I set out a large area of newspaper as well. One at a time I lightly dabbed the poly balls in the yellow paint and the rotated and dabbed on the newspaper to get a light covering almost all over. I didn’t want it to be completely yellow just parts, if I had a pump spray paint it would have been easier, like the spray butter! After they dried, I hot glued them all over the hat, starting on the band area so that the hat itself wouldn’t be seen, then I piled them up as I got to the top. I also used linen to top the box with. I glued it all around about two inches from the top, and then cut a hole for his head to fit through. I attached more balls with hot glue, to fill it up. For the bucket, all I did was attach red ribbon from one side to the other to use as a handle. This is AMAZING! I was hopeful I could create it as well but then reading your description I think it was a lot of work! Bravo and it is one of the best kid costumes I’ve seen!